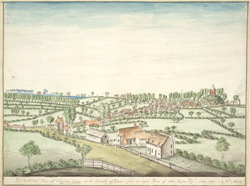 View showing the village of Chipping Ongar in Essex in 1801. Chipping Ongar dates back to Saxon and Norman times and is located in western Essex. The position of the artist, William Moore, 'from an upper room of John Hughes Esq' allows him a good view of the village and surrounding landscape. Various village buildings are clear enough to be identifiable including the Norman parish church of St Martin of Tours, and the castle lying north east of the church, on a mound of approximately 48 feet high.